This wine has a wonderful, deep, intense ruby red colour with important, solid, and wide organoleptic qualities, but above all it exalts the food it is combined with. It is very rich in polyphenols which harmonize with its fresh, tasty acidity. It is versatile red, quite innovative in style which can be appreciated immediately. It adapts easily to various dishes and can be drunk litghtheartedly drawing great pleasure from the sharp fragrance of its perfumes and its straightforward character. It should be drunk in wide crystal chalices where it can best develop its bouquet at a temperature of 18-19�C. 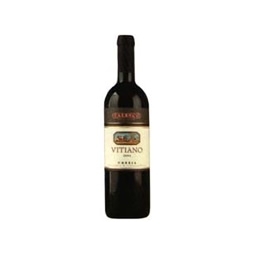 A blend of 33% Merlot, 33% Cabernet and 34% Sangiovese grapes grown in the region of Umbria. Vitiano is vinified in stainless steel tanks and aged in Nevers barrels for 3 months before being bottled. This is a young red wine with explosive, luscious aromas. The wine has a wonderful deep, ruby red color with a wide range of organoleptic qualities. It is rich in polyphenols and balanced acidity. This versatile red is at it's best in its youth when the fresh fruit character is most evident. Vitiano is a perennial value.